A few weeks ago I went to one of the vegan cooking classes at Spork Foods. For father’s day I gave my dad a choice of any class and he picked the Mediterranean menu. Of course, on the day, I forgot to bring a camera. I was so enamored with everything that was made, I had to make some of it for Shawn a few days later. I chose the gazpacho, as it was a perfect cool treat for summer. 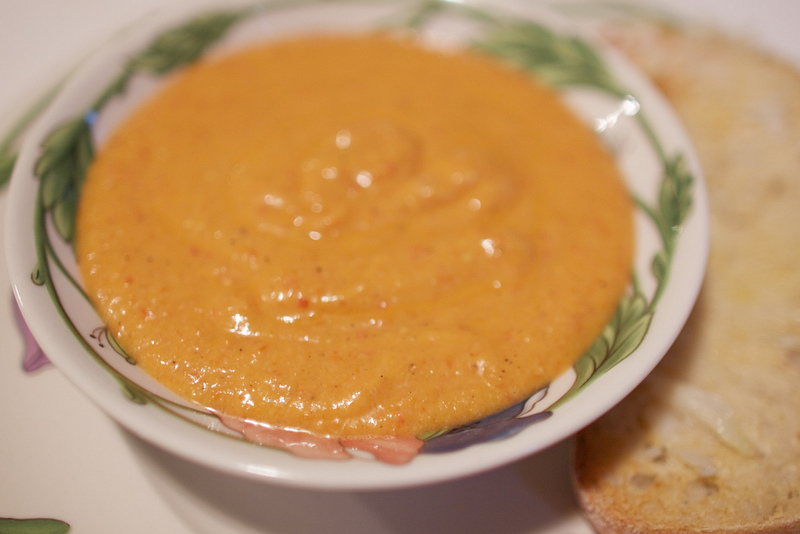 Filled with veggies and rich flavors, I’ve never had a gazpacho so good. When I received the upcoming class schedule from the Sporkies a day or so ago, I thought I should post something because all the classes look so freaking good. There’s a Italian gluten free class with Cashew Cream Fettuccine Alfredo with Spinach and Pesto Crusted Tempeh Fillets. There’s a Southern Comfort food class with Fried Green Tomatoes and Sweet Potato Biscuits and Gravy. Not to mention a Local Seasonal Fall class with Spiced beer-soaked figs stuffed with a creamy ricotta and Seitan Wellington with a Creamy Spinach Sauce. Does that not sound amazing? I seriously want to go to all these classes. The Spork Food classes are so much fun. You really learn so many little tips and details about nutrition. The Spork sisters make me want to be a better person. I’m not kidding. Plus the food is all so fresh and inspiring, and of course you get to eat it in the end. Their classes are also great for bringing your friends and family to show them how great vegan cooking can be. Trust me, they will be impressed. Or if you need some vegan cooking tips yourself, these classes are super helpful. Anyway, go check them out. I highly recommend their classes, and their new space is West Hollywood is great. I should also add, they didn’t ask me to post this, nor am I getting anything from it, I just genuinely think they’re great and want to support an awesome vegan business. I LOVE the Spork sisters! They really are wonderful human beings and teachers. I have been to a handful or more of their classes and have taken my mom once, as well. The new schedule looks awesome! I love the Spork Sisters! They’re so sweet, and I’m dying to take a class. I just have to wait until my bank account plumps up a bit! I have been wanting to make a potpie for weeks – now is the perfect time! LOOKS DEEEELICIOUS! damn, that food sounds amazing!